Home » barack obama , christmas tree , constitution , department of agriculture , farming , government , taxes , what the hell were they thinking » You're a mean one Mister Obama! 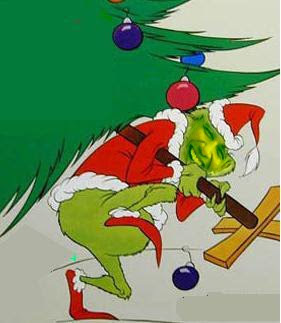 President to impose "Christmas Tree Tax"
You're a mean one Mister Obama! President to impose "Christmas Tree Tax"
President Barack Obama's administration is trying to impose a 15-cent "Christmas Tree tax" on all freshly-cut trees intended for Yuletide celebration. Fifteen cents on the sale of every tree to... get this now... "enhance the image of Christmas trees and the Christmas tree industry in the United States." Okay, two things that already stick out in this blogger's mind: that this is a tax without any representation or due process, regardless of what the administration is arguing. Indeed, within the text of the "order" issued by the Department of Agriculture it is found that "...the assessment provided for in this type of program is not a tax nor does it yield revenue for the Federal government. These producer and importers funds raised by producers and importers are for the benefit of producers and importers." What. The. Hell?!? Ummmm this is an attempt to use the force of the federal government to extract from us money against our consent, and they have the audacity to say that this is not a "tax" because it's doesn't "yield revenue for the Federal government"?! If it's not for the Federal government then what is this money being taken from us for?!? And then I have to make note of how I'm hard-pressed to see how this isn't acting in respect toward an establishment of religion. True, there are many Christians who do not celebrate the holiday of Christmas, and that is fine. However, I can't find in the text of the order or anywhere else in the Federal Register that there's going to be a parallel tax imposed on Kwanzaa Trees. ...but I've no doubt that even worse is being thought of as I write this. The Department of Agriculture is saying that this request came from something calling itself the "Christmas Tree Checkoff Study". Until tonight this cryptic group barely appeared anywhere, except for the proposal and order in the Federal Register and this website at checkoffstudy.blogspot.com. I went to that errr, "industry site". All I found was that there are ten people said to be from the Christmas tree industry who met with Department of Agriculture to push for this tax. However I can't find out anything about who exactly they are. Well, further along at checkoffstudy.blogspot.com it is found that Christmas Tree Checkoff Study is allegedly acting at the behest of an outfit called Christmas Tree Promotion Now. Christmas Tree Promotion Now has a slightly more proper website at christmastreepromotion.com... but there again, there can be found NO information at all about who exactly constitutes this "industry-wide group of producers and importers". In the past hour or so I've contacted two friends who each grow Christmas trees for commercial sale, and they didn't know anything about this tax either until I told them about it. Nor had either of them ever heard of Christmas Tree Checkoff Study or Christmas Tree Promotion Now. I don't think it's an invalid question at all: WHO is asking for this tax? Let's see some names! Why not a voluntary program? Voluntary marketing efforts have had success in the Christmas tree industry; however the challenge has always been the ability to sustain funding. A program that provides fair, consistent funding for promoting farm grown Christmas trees is needed so that all producers and importers can benefit. There will always be a small minority attempting to side step the system. Because this would be a Federal program, then those who are assessed are legally required to comply. Ummmm... WHO EXACTLY GETS TO DECIDE WHAT IS "FAIR"?!? And that "there will always be a small minority attempting to side step the system" so there needs to be "a Federal program" to make those dissidents "legally required to comply"?! That is government-enforced thuggery at its worst! Again, I would like to know who exactly is pushing for this tax. As things stand at this moment, there are only two possibilities that come to mind: either it is the Obama Administration itself, or it is... well, let's just call it "crony capitalism". Christmas trees need image help from the government? Beam me up Scotty, there's no intelligent lifeforms down here. While I am no fan of Obama, I think reflexively bashing anything his administration does, no matter what it is, is ultimately unproductive. For instance, a lot of the author's concerns would be remedied if he simply stopped to look at the actual federal regulation. Here is a link to it. For instance, it is worth pointing out that, the last time this program was tried, it helped result in an increase of 9 million trees sold annually. For around a $4m outlay, the program helped increased sales by a minimum of $135m. That's one heck of an increase. Granted, not all of the increase is attributable to the program, but at least a sizable chunk is. Additionally, the author talks as if this program is some sort of unwanted burden on tree farms. The regulation directly contradicts such an assertion. It states that it was the tree farm industry that presented this idea to the USDA, and that they were the ones that requested something like this be implemented. Likewise, the program only exists on the consent of the tree farm industry. The industry has the authority to vote to rescind the program if they feel it is no longer useful. I appreciate a vigorous critique of Obama and his agenda as much as the next guy, but there is no point in reflexively decrying everything he does simply because he's Obama. If the Christmas tree industry wants to improve the image of its product, then it can do so WITHOUT the "help" of the federal government. And who are the people from the industry that requested this tax, anyway? I found in the text that this tax comes at the request of something called the "Christmas Tree Checkoff Study". I did a Google search and found next to NOTHING about this outfit. Oh yeah they got a website, it's at checkoffstudy.blogspot.com. There are TEN people said to be from the Christmas tree industry who met with Department of Agriculture to push for this, but I can't find out anything about who exactly they are. The Christmas Tree Checkoff Study is something allegedly acting at the behest of an outfit called Christmas Tree Promotion Now, and there is a slightly more proper website for it at christmastreepromotion.com but there again, NO information about who exactly constitutes this "industry-wide group of producers and importers". I've two friends who each grow Christmas trees for commercial sale, who I've contacted in the past little while and they didn't know anything about this tax either until I told them about it. I don't think it's an invalid question at all. Who is asking for this tax? Let's see some names. Chris the major dairy producers have been doing this for years with the fed gov! The ads for Got Milk? they are paid for by Dairy Promotion Program of the USDA. Small family dairy farms have to pay thousands of dollars and the government forces them to. This is not something new you're just now finding out about it being done with Christmas trees. Doesn't promoting the cutting of trees on such a magnitude go against the greenness of this administration? lol To "Anonymous", I have to ask what makes it government's role to use OUR money to beef up any one industry? Is that what your history classes taught you? Christmas is the biggest holiday and more consumer spending is done then than any other time of year, so I fail to see why it needs more of our money to promote itself! Our federal govt needs to be lessening it's involvement in private industry, not increasing it.